DIRECT BEACHFRONT w/ Superior Views. Recently Remodeled, new A/C, Sleeps 6. 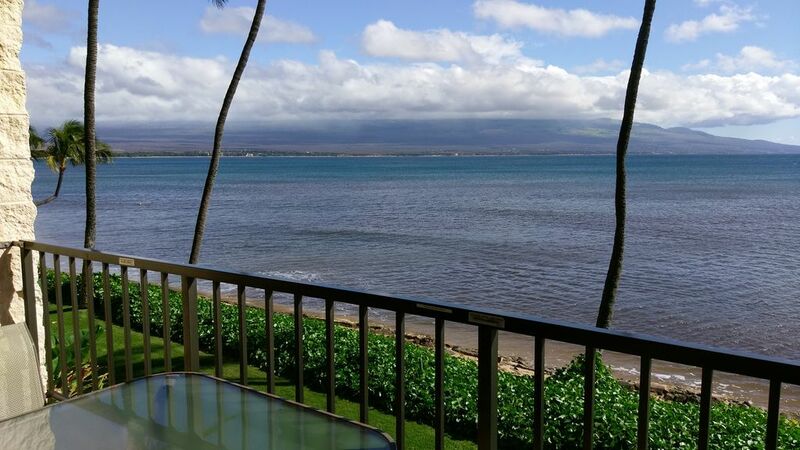 Remodeled 2BR/2BA condo DIRECTLY on Sugar Beach in Maalaea. Full kitchen, W&D. Crew Rest Maui is a hidden gem at the north end of Ma'alaea Bay in South Maui. Our privately owned two bedroom, two bathroom beachfront 'home away from home' is a corner unit on the second floor of a four-story building directly at the water's edge. Our private lanai, 30 feet from the ocean, looks across white sand beach and ocean to neighboring Islands, the world-famous Molokini crater, and 10,000 foot Haleakala. It provides the perfect winter viewing spot to watch, up close and personal, the mother hump back whales train their young for their long trip back to the Northern Pacific. Inside you'll enjoy new granite countertops in the kitchen and baths, new Indonesian teak cabinetry throughout, new ceiling fans, new tile in the master shower, new sinks and faucets, fresh paint throughout, new rugs, brand new queen sleeper sofa with extremely comfortable memory foam mattress, new counter-height dining set, and brand new entertainment center with 55" flat screen TV. Just click through our photos to see all these gorgeous improvements. New split A/C system was installed in late March 2019! This top of the line system includes three cooling units to allow the master bedroom, guest bedroom, and living room/kitchen area to be cooled individually for optimal comfort. There are HUGE benefits to a corner unit on the second floor, and it's important to understand why the location of the unit in the complex makes such a huge difference. The master bedroom has a comfortable California King-size bed with a private bathroom and wall-to-wall windows with panoramic views of the beach, gardens, and pool/BBQ area. The second bedroom, with a view of the pool, courtyard and ocean, can be configured as a King or 2 Twins per your request. A second full bathroom is across a small alcove from the second bedroom. A queen-size sleeper couch in the living room can accommodate up to 2 additional guests. This is not your typical sleeper sofa! We splurged for the top of the line, memory foam mattress for the sofa bed and couldn't believe how comfortable it is! We have gone above and beyond to provide you the little touches to make your stay as comfortable as possible and make Crew Rest Maui feel like your home away from home. We've added plenty of plush beach towels, some dish/laundry soap to get you started, beach toys and boogie boards, liquid soap in the bathrooms, velvet non-slip hangers, Keurig coffee maker, keyless entry keypad, secure WiFi, and a well-equipped kitchen with EVERYTHING you'll need. The living room features a smart, flat screen TV with cable and a DVD player. The guest bedroom also has a TV with an Apple TV which gives access to cable TV and allows you to sign in to your Amazon, Netflix, or Apple accounts for more entertainment choices. The private lanai gives us so much enjoyment and is the best feature about the unit. Again, it is DIRECTLY on the water, and not all units in our complex have such an amazing location and views. The lanai is a perfect place for reading, eating, whale watching or just plain relaxing to the sound of the gentle surf. We constantly enjoy watching sea turtles directly offshore from our lanai, and we also love that we can watch our children play in the sand right from the lanai. Sugar Beach, which runs in front of our condo, continues east to the north end of Kihei as part of the Kealia Nature Preserve. This protected land translates to no development, no traffic, and no problems - just 4 miles of empty white sand beach! If you're new to Hawaii or this area of Maui, you need to be aware of the beach conditions before you book a vacation condo! If your family is interested in swimming in the ocean or snorkeling, surfing, etc. you need to make sure the beach in front of the property you book is sandy and swimmer-friendly. Many condos in Hawaii have beautiful views and are waterfront, but have rocky beaches that are not at all conducive to swimming or other water activities. Our beach is AMAZING! Very sandy and kid friendly. You can wade right out into the water for swimming or snorkeling. This is important to know before you book! Just down the street from our condo, you'll find the core of Maalaea and the harbor area. This adorable seaside village offers a wide variety of activities such as snorkeling excursions and sunset cruises, shopping, delicious dining options, mini golf, an aquarium, and the Pacific Whale Foundation. We feel the central location of our condo is ideal for exploring all of Maui. You're just 15 minutes from the airport, 25 minutes from the North Shore, 10 minutes from Kihei, 20 minutes from Lahaina, and 5 miles or less from several golf course options. Our favorite aspect of Kanai a Nalu is the quiet, laid back feel of the complex and this stretch of beach. If you like the hustle and bustle of crowded resorts where you sleep in a cramped hotel room and share a beach and pool with hundreds of people while enjoying a $15 cocktail, this is not the place for you. Crew Rest Maui offers the ultimate in beachfront relaxation. Our spacious condo, uncrowded beach and pool, and quiet, low-key ambience provide the best vacation experience available on Maui. We are Mike and Stephanie Jeffers, and we live in Carefree, AZ with our 2 daughters. When we first visited Maui together almost 10 years ago, we fell in love with Maalaea Bay and began dreaming of owning a place here one day. After years of determination, hard work, and planning, we were finally able to turn this dream into a reality in October 2018. Our condo's name, Crew Rest Maui, comes from our family’s deep history in the world of aviation. Mike is a pilot, both in the Air National Guard and for Southwest Airlines, and several generations before him were aviators as well. The term “crew rest” refers to the appropriate downtime and rest required for a pilot to fly safely, and we like to think that our condo and this beautiful location on Maui provide that kind of relaxation and rejuvenation to everyone who stays here. We fell in love with Maui the very first time we visited. This condo is a dream come true for us, and we treat it as a true labor of love. When you visit, you will see and feel the level of quality and comfort we strive to deliver. We have invested in new furniture, decor, household goods, etc to ensure your stay is as comfortable as possible. We've been staying in VRBO properties for years, and we understand the little touches that mean so much to guests. We've worked hard to incorporate those things into our unit to provide a superior vacation experience! Our unit is VERY unique because of its location in the Kanai a Nalu complex. Our unit is one of the few corner units, which provide unique features that other units don't. One, you only have one shared wall, and in our unit BOTH bedrooms have ocean views. Be aware that in the majority of units in KAN, the second bedroom faces the parking lot. Two, the front door of our unit is at the end of the hall, with zero traffic in front of it. In Maalaea, you will enjoy leaving the front and back doors open to let the tradewinds blow through the unit thanks to the screen doors. But in most units, there's constant traffic in front of your door, with people peeping in. Our unit is at the end of the hall, meaning there's no traffic in front of your door. Three, our unit features unobstructed ocean views from the entire kitchen and living area. Depending on location, many units in the complex face towards the pool area or even other buildings. Look through our photos and you'll realize we have a superior view. You can literally see Molokini from the sofa and watch surfers while you load the dishwasher! You're traveling to Maui--get the best view possible! toilet, shower, Insuite master bath has a shower stall. Nice sandy beach with small wave action most of the time. Just 35 ft. from beach with no obstructions between you and the beach. Mount Haleakala and world-famous Molokini can be viewed from the lanai. Split system installed March 2019. Individual air units cool the master bedroom, guest bedroom, and kitchen/living room areas for total comfort. Has ice and water dispenser on the door. New summer 2014. Ceramic top range. New summer 2014. Over range. New May 2015. Blender, Electric tea kettle, Keurig and traditional coffee pot, coffee grinder, Magic Bullet. Up to date with many appliances. New granite counter tops installed November 2016. New, 55" flat screen TV in the living. There's also a TV with an Apple TV in the guest bedroom for guests to sign into Netflix, Amazon, Apple etc and enjoy movies and TV shows. Cable in the living room, and an Apple TV in the guest bedroom that allows access to cable TV. Plenty of lounge to use around the pool and on the lawn. Maalaea Harbor is right down the street and offers many options for snorkeling, whale watching and dinner cruise excursions. You will not find a better lanai view! Our unit is directly in front of the sandy beach and has views of world famous Molokini. Boogie boards, beach toys, and some snorkel equipment can be found in the guest bedroom closet. Three miles North on Highway 30. Thank you! Absolutely wonderful stay in this condo! Great location and beautiful view! Awesome condo with all the comforts of home. Looking forward to our next visit! Very nice condo, view is amazing. Enjoyed our stay and watching the whales was great. Thank you, Jeff! We are so happy to hear you enjoyed your stay, and we hope you'll think of us when you visit Maui again. Mahalo! Very stylish and cozy condo. We enjoyed watching the sunrise over Halekala crater and watching whales jumping in the distance. The location is central to shopping, the airport and the many sites and beautiful surroundings of Maui. Highly recommend the spot. Mahalo! Thank you for your kind review!!! We love to hear when people enjoy our little piece of paradise. How wonderful that you also got to enjoy watching the whales! What an amazing experience. We hope you'll visit us again in the future. Mahalo! We loved everything about Crew Rest! Great location on Sugar Beach with miles of sandy beach to walk, whale watching from the lanai, turtles swimming by every morning, sunrises over Haleakala, nice central location, well-appointed, comfortable condo with new furnishings, and a great kitchen to prepare meals. We will be back! This review makes us so happy! We are so happy you had a good time and enjoyed our condo. We are continuing to make improvements and updates to make our guests even more comfortable. (A/C is being installed this week!) Definitely think of us when you visit Maui again. We'd love to have you back! Mahalo!!! We thoroughly enjoyed our one month stay at Crew Nest. The condo itself, was bright, clean and tastefully decorated with many recent updates. The owners have thought of everything anyone could possibly need for a lovely stay. We had a few minor glitches that were quickly and cheerfully attended to. The views from the lanai watching swimmers, snorkelers, and boats coming and going were great, not to mention the beautiful sunsets. We have no hesitation in recommending this unit. Barrie and Bev, Victoria, B.C. Thank you so much for this wonderful review! We are so thrilled to hear that you enjoyed your month at Crew Rest. You were a joy to have as a guest, and we hope you’ll be returning in the future. Thanks again. All prices are in US dollars. Rates are subject to change until reservation is confirmed.